Independent CDI power supply socket. Receiver power completely separates with the CDI power, so you should not worry about that CDI arouses high frequency signal will interfere the receiver. 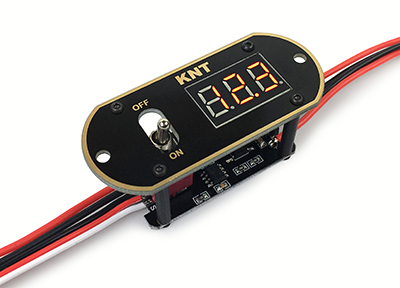 Integrated large current switch and a three led segment display the battery voltage. Using ultra high brightness led segment which can clearly visible in the sunshine. using switch channel of the remote control to control the CDI (usually use the fifth channel). the gasoline engine CDI remote control on or off, so that the effective protection of the aircraft and personal safety. Not allowed to counter-battery polarity. Do not come into contact with installation of grease or water, or near a corrosive substance.